Work your style with the TIGI Bed Head B for Men Pure Texture Molding Paste, a versatile paste-cream. The Molding Paste creates maximum texture and maximum support for all hair types. The non-flaking styling polymer Mirustyle enhances definition, while a wealth of conditioning agents ensure that hair remains moisturised and healthy-looking. Hair remains pliable thanks to Caranauba Wax, and stray hairs are smoothed away with refined Shea Butter. Work through wet hair for a firm hold, or dry hair for a medium hold with a matte finish. Natural Refined Beeswax hold and control. 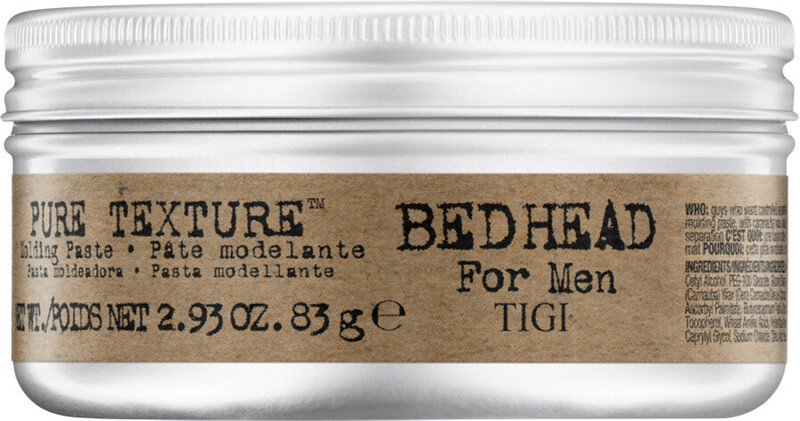 TIGI Bed Head For Men Pure Texture Molding Paste 83g is rated 4.0 out of 5 by 1. Rated 4 out of 5 by woody73 from Tigi Texture Paste - a paste that works, A great product. Beware that it does set very firmly so if you have mid length hair it will dry a little crispy if you put too much on. I found the product to be great as I have natrually dry and frizzy hair so it gives me a style and hold that lasts all day, even if the back of my head rests on a chair, it does not come out, but unlike gels and other products it does not look wet. Great smell, easily applies from squeeze tube and washes off with the greatest of ease in the shower as it is not a wax based product.